It’s a simple thing to get someone’s name right. Yousendit had an opportunity. 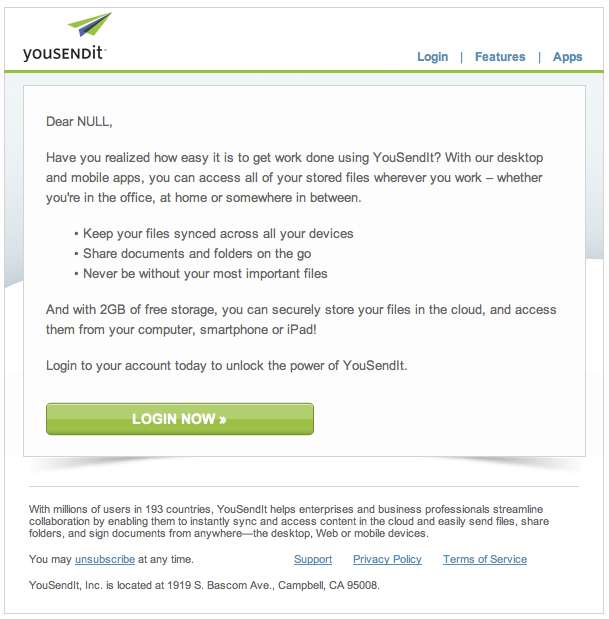 They had my email address from whenever I had signed up to their service in order to download some file or another. I knew the service and trusted it enough to sign up, and if I had left my email address, I had surely left my name as well. Since then I obviously haven’t been back, but they had the opportunity to send me a single, polite, targeted email message to remind me of the service, let me know what’s been happening, and maybe convinve me to come back, check it out and perhaps even start using it again. 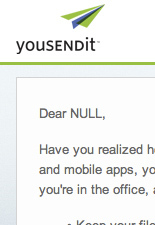 And yet the first line of the email: “Dear NULL”. As someone whose name people often get confused (I get called “Gil” a lot. Evidently it’s quite a popular French name here in Europe), I know how not-nice it is to be addressed with a name that’s not your own; especially by people who are supposed to know you. Each opportunity to have to have a meaningful conversation with a user is a gift. It’s a unique chance to build a valuable relationship with someone who will use your products or services and tell others about their great experience. Attention is more and more expensive and more and more rare, so when you manage to get the attention of your users, even for a moment, use it wisely – don’t squander it. And you can start by getting their name right. This entry was posted in Product Design and tagged attention, attention to detail, email. Bookmark the permalink.